Sunday night was the season premiere of Season 3 of True Blood on HBO. I got addicted to the show about a year ago when I started reading the books by Charlaine Harris that the TV show is based on. I’m currently reading book 9 in the series and it’s really hard to put down. I could have read the entire series in about a week, but I knew if I did that then it would be over and I’d have to wait patiently for Charlaine Harris to write another one (I really, really hope she keeps this series going, I love it!). So I made a deal with myself that I had to read one or more books between each book in the series. It’s been hard, but at the same time, reading each book is like savoring every bite of a really good dessert to make it last just a little bit longer. In season one of True Blood, there’s a scene where the main character, Sookie, is eating a pecan pie. It was made by her grandmother who had recently passed away and as she eats each bite, you can literally see her recalling memories of her grandmother and grabbing onto each one to lock into her heart forever. In honor of the season premiere, I made a pecan pie. 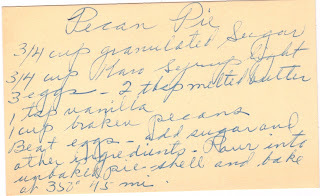 But not just any pecan pie, one made with pecans that were picked and shelled by my grandfather before he passed away last April. Both my mom and my grandmother have bags of these pecans in their freezers. The last time I was home, I asked if I could have one. Holding it in my hands, I felt connected to my grandfather and could imagine him collecting the nuts from his backyard and sitting on the porch freeing each one from its shell. I felt honored to be able to make a pie with his pecans. And with each bite, I could taste the memories I have of my grandfather come back to life. My grandfather was an avid hunter and fisherman. It all began when he was a small boy growing up in the northern suburbs of Chicago, which at that time were rich in farm fields and open land, much unlike the landscape of the area today. He’d go hunting or set traps before school and then check those traps after school was over. He carried this passion with him his entire life. When I was a child, he took me hunting and fishing with him. I think I only went duck hunting with him once, and after watching the beautiful ducks get shot out of the sky and carried dead across the field, I officially retired from the sport (I was about 5 years old). But fishing was something that I loved to do with my grandfather. I have two very clear memories of our fishing adventures. The first was when I was about eight years old. We were fishing in a boat on a lake near where I grew up. As we cast our lines into the water, he began to tell me about the various types of fish in the lake. One fish, the Bullhead, particularly caught my attention because he mentioned its sharp barbs. He told me that if we caught one, I was to be careful of it flopping around in the boat and to let him take it off the hook. No problem, I thought, I sure didn’t want to get stuck. So what’s the first thing I catch? The dreaded spiked fish, of course. No fish likes to be speared by a hook and plucked out of the water, so as soon as we got it into the boat, it began thrashing around. My first reaction, as an 8-year old who didn’t want to get hurt, was to launch myself to the edge of the boat as far away from the dangerous fish as possible. 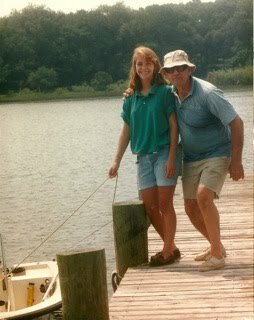 My grandfather, who was trying to carefully grab the Bullhead and steady the boat at the same time, yelled at me to settle down before I tipped us over. Looking back, I can imagine standing on the shore and watching the scene play out. It would have been hilarious to watch. At the time, however, I was scared. I didn’t want to get hurt, but more importantly, I didn’t want to disappoint my grandfather. But I’d get a chance, years later, to truly prove myself. My grandparents retired to Florida when my brothers and I were young. On one hand it was awful because we didn’t get to see them whenever we wanted to anymore. On the other hand, it meant that we got to go to Florida every summer and spend a week or two visiting, playing on the beach, and fishing with my grandfather. Sometimes we’d surf fish for pompano right from the beach. Other times, we’d take the boat out into Pensacola Bay. Those trips meant waking up before the sun and spending hours sitting on the boat hoping that you’d at least get a nibble. 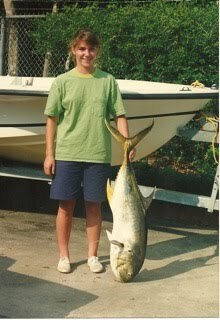 Once, when I was in high school, I got more than a nibble, I caught the biggest fish of my life. For nearly an hour, I battled that fish on the line and my grandfather chased it in the boat. I kept asking him to take the rod, but he told me it was my fish and I had to bring it in. He also sternly reminded me NOT to drop the pole in the water if my arms got tired. Somehow, I won the battle and the tired fish was finally pulled into the boat. It was a Jack Crevalle that was nearly half as long as me. What was even more rewarding than heaving my massive opponent into the boat, was seeing the expression on my grandfather’s face. He was positively beaming. This was a story we were going to have a lot of fun sharing for years to come. Stories are what I remember best about my grandfather. Maybe he’s the one I inherited my love of storytelling from. And remembering all of our fishing expeditions is starting to shed some light on my obsession with the show River Monsters on Animal Planet. Although I loved his hunting and fishing stories, his airplane adventures were my favorites. 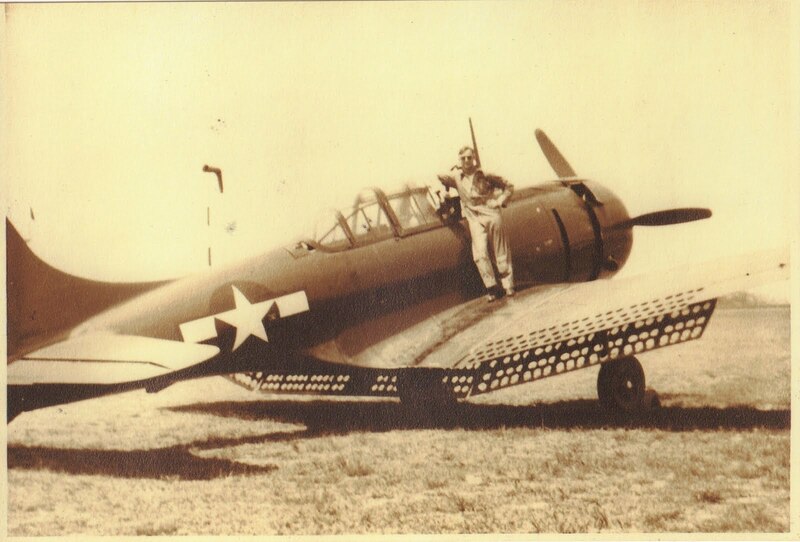 My grandfather was a Navy flight instructor during World War II. He was stationed at the Navy base in Pensacola and had the most incredible stories about training runs with his students, mechanical problems in mid-flight with his planes, and even a fly-by he did on my grandmother’s house when they were dating. I could sit and listen for hours to those stories. I marveled at his bravery and courage and felt his pain when he recalled all the pilots he trained who never made it home from the war. I always wanted to get a tape recorder and record him telling those tales so that I’d never lose the sound of his voice when I thought of them. But last April, he fell ill. I traveled to Florida with my parents to help take care of him. Upon our arrival, he learned that his condition was terminal and that he had about a year to live. We set up hospice in his home and for two weeks, I sat by his bedside absorbing every detail of the stories I loved so much to hear. My parents and I needed to return home for a short while, but as we said goodbye, we promised we’d be back very soon. I needed to hear more stories; I needed to record those words I loved so much. Little did we know that those two weeks were all we’d get. I had been home in Minnesota for a little more than a day when I got the call that he had passed away. The stories that I loved to hear were gone forever. I cursed myself for never recording them, but I knew that the ones I remembered would be locked away in my heart forever. In addition to being a hunter, a fisherman, and a pilot, my grandfather was also a teacher and a coach. He taught me how not to “throw like a girl” and instilled in me a drive to perform at my best. Between the sports and fishing I did with my grandfather and the hiking and camping adventures I took my with my dad and our dog, I believe I have the two of them to thank for my tom-boy spirit. And I wouldn’t have it any other way. Just before my grandfather died, he received a letter from one of the boys he coached in hockey. After high school, the man had gone on to enjoy a very successful career in college hockey and even set school records. He credited my grandfather’s coaching for all of his success, not just on the ice, but in the rest of his life as well. My grandfather had had an incredible influence on him and his lessons stayed with the man for his entire life. After my grandfather’s death, more of these stories began to surface from previous students and athletes. It was amazing to see the effect my grandfather had on the lives of people he encountered, especially the kids who would keep those lessons with them into adulthood and reach out to his family after his death to share their love for a man who had made a difference in their life. It was wonderful to know that I wasn’t the only one keeping his stories alive, there were people across the country who would remember my grandfather either as a teacher, a coach, a sportsman, an adventurer, or all of the above. As I sat down to enjoy my piece of pecan pie, I imagined each nut representing a story my grandfather had shared with me. I thought back to Sookie eating the last piece of her grandmother’s pie, knowing that when it was gone, there would never be another one. I took a bite, slowly pulling the pie from the fork into my mouth, savoring each moment it was on my tongue and hesitating to swallow. It’s hard to go wrong with pecan pie and this one was absolutely delicious. 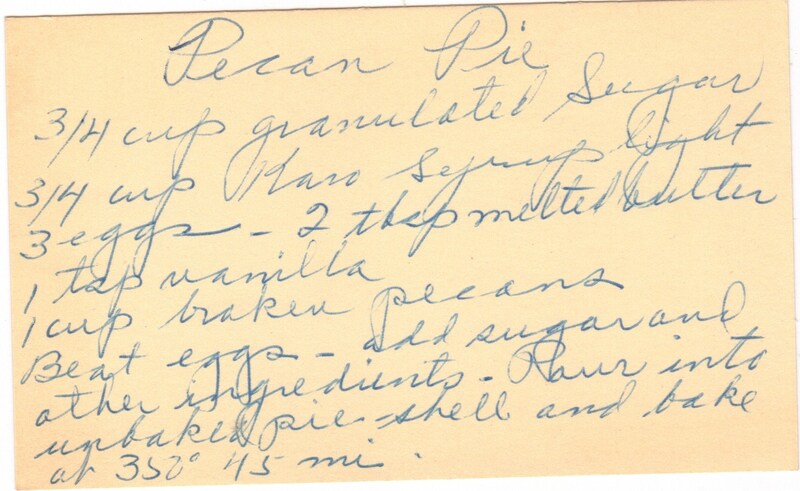 But knowing that each of those pecans had touched my grandfather’s hands made the pie even more wonderful. I still have enough pecans for a few more pies. Someday, however, they’ll run out and all I’ll be left with is the sweet memory of that very special ingredient. But I’ll be sure to lovingly tuck that memory on the shelf in my mind between the ones of the infamous Jack Crevalle and the scary barbed Bullhead. Pappa's so proud! He's probably smiling from ear to ear. He would love this entry. He would love your pie. He loved you! What a fantastic entry and memory! And I too am OBSESSED with TrueBlood and the Sookie Books!!! If I don't talk to you, see you on Monday!